Eat or Be Eaten: New York City’s Cymbals Eat Guitars are living up to their anointed status. The brave new world of do-it-yourself indie music notwithstanding, the music industry is still very much eat or be eaten. Oh, the eaters may be different: Instead of the Geffens, Elektras and Warner Bros. megaliths, more and more it’s getting to be the Matadors, Merge Records and journalistic indexes of hip, like Pitchfork.com, that elect the anointed and renounce the unchosen to a kind of obscurity that is too obscure to even rate “nerd cool” points. Thus it was that Cymbals Eat Guitars, a quartet from Staten Island with only the modest goal of playing Weezer covers and having fun, moved to Brooklyn and released their debut of original songs Why There Are Mountains without the benefit of a record label in 2008. A little buzz, including Pitchfork naming them “Best New Music” and rating their album an almost unheard of 8.3/10, launched the barely-two-years-out-of-high-school combo into “breaking band” status, “one to watch” or however the cognoscenti configure it. But then there’s brilliance behind the buzz: The band has an uncanny ability to consolidate familiar elements of indie rock and add their own stamp of originality. Not that there’s any assurance that they won’t fall victim to the malady of the sophomore slump, or that Pitchfork themselves haven’t fallen prey to a kind of journalistic over-appreciation on the other side of which the publication usually errs, but there’s something worth taking the time to give a good listen. Vocalist/guitarist Joe D’Agostino has obviously listened to Doug Martsch of Built to Spill as well as Modest Mouse’s Isaac Brock, and the drive and sweeping scope of the songs on CEG’s disc carry on in those bands’ traditions. The grand, sometimes orchestral arrangements as well as wide range of dynamics that hearken clear back to Nirvana encapsulate a whole range of indie/alternative musics, making it a surprisingly diverse debut, as well as probably guaranteeing a fan base carrying over from other groups—as notoriously niche-y as the world of indie listeners is. Bassist Matt Whipple doesn’t take these likenesses too seriously, though he does acknowledge some truth to them. “People like to reduce new bands down to two or three reference points, and it does not usually indicate a great deal of insight or close listening.” Close listening is one thing this band can stand up to, with an attention to detail that is surprising even given the availability of home production tools now. Whipple is aware that Pitchfork’s imprimatur can be a mixed blessing. 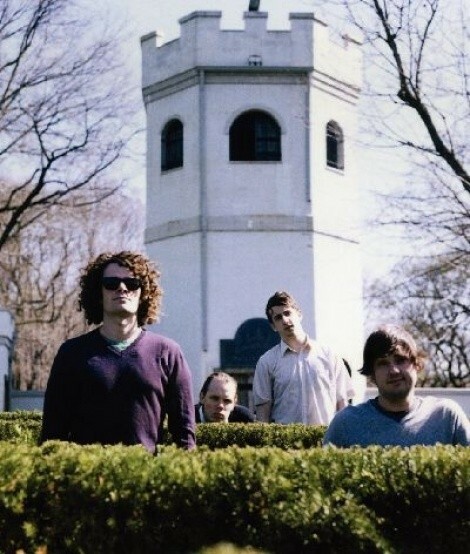 “There are some perils involved in being a Pitchfork-heralded band that we are well aware of, and we have basically been out touring the country and the world ever since, working to prove to people who are intrepid enough to come see us that Pitchfork wasn’t wrong.” They take the correct approach in their live shows to creating the right impression, he says, not attempting to replicate impossibly dense overdubs but just playing the soft parts softly and the loud parts very loud indeed. One thing that never seems to change in any genre of music is that the real, day-to-day job of being a musician for any length of time is still hard work.